Back in January, I won a book from the monthly Foodies Read drawing! 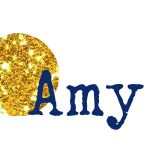 I won the book Food Swap by Emily Paster. The book begins my defining a food swap. A food swap is basically a Farmer’s Market type setting only with homemade canned goods (jams, pickles, salsa), spice blends, cookies, granolas, you name it! And instead of selling the goods, a bartering system is put in place. 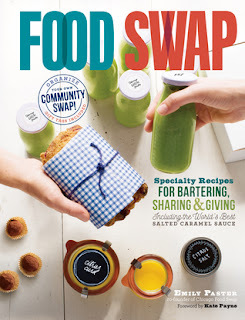 After defining a food swap, the book outlines how to set one up in your own community and then offers a wide variety of recipes that can be very successful at food swaps. Personally, I don’t think a food swap would be for me. You really have to be willing to put yourself out there. My introverted self gets anxious just thinking about it! One recipe I had dog-eared was for mini frittatas. 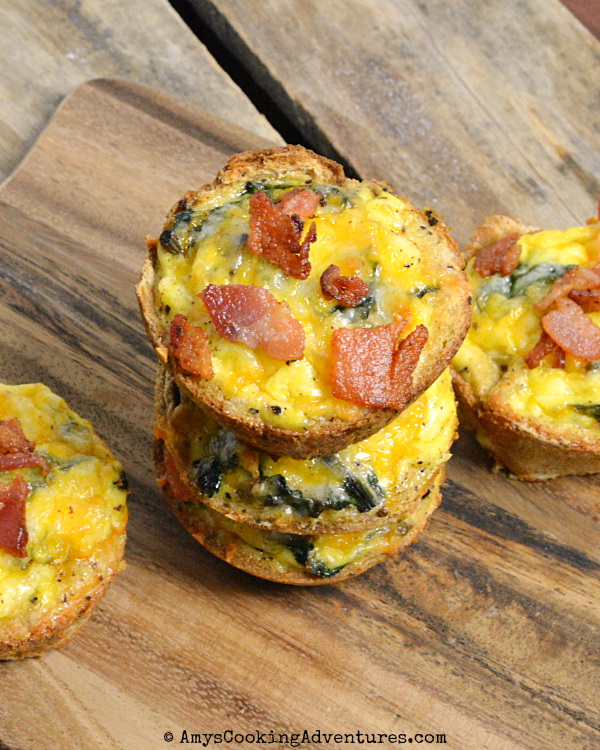 But then, I thought, why not add toast and make mini quiches? Then I thought, why stop there? Better add bacon too! These yummy little quiches were delicious, though I was totally underwhelmed by the toast crust. I made a few that were actually frittatas and they were much better (goes to show – sometimes you really shouldn’t mess with a recipe!) The quiches (or frittatas) came together quite quickly on a busy weeknight and the leftovers were perfect for work the next day! I could totally see swapping out the toast for crescent roll dough (which I did for Brunchweek – yum!) and it would be easy to leave out the bacon for an amazing meatless option! Cut the butter into 12 pieces, place 1 piece in each cup of a 12-cup muffin tin. Place the tin in the preheating oven for 2-3 minutes or until melted. Use a silicone brush to brush the butter along the sides of each muffin cup. 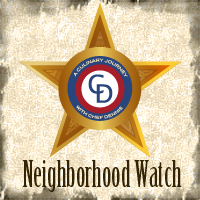 Use a 4-inch biscuit cutter to cut the center out of each piece of bread (if using). Use a rolling pin to flatten each round. Press the round into each well of the muffin tin. In a large skillet, cook the bacon to crisp. Remove the bacon and crumble. Divide ¾ of the bacon among the lined wells, reserving the rest of the bacon as a garnish. Drain of most of the bacon drippings and place the skillet on medium-low heat. Add the onions and greens and sauté until the onion is tender and greens are wilted. Add the garlic and cook until fragrant. Divide the greens mixture between the muffin cups. Place the eggs and milk in a bowl and whisk to combine. Pour the egg mixture evenly into each muffin cup. Season with freshly ground black pepper. Bake in the preheated oven for 18-22 minutes. Garnish with the remaining bacon and serve. 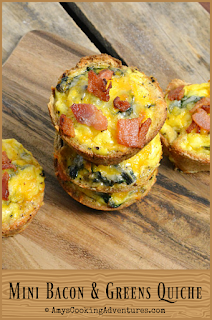 Mini Bacon & Greens Quiche are a quick, delicious breakfast on the go! Preheat the oven to 375 degrees F.Cut the butter into 12 pieces, place 1 piece in each cup of a 12-cup muffin tin. Place the tin in the preheating oven for 2-3 minutes or until melted. Use a silicone brush to brush the butter along the sides of each muffin cup.Use a 4-inch biscuit cutter to cut the center out of each piece of bread (if using). Use a rolling pin to flatten each round. Press the round into each well of the muffin tin.In a large skillet, cook the bacon to crisp. Remove the bacon and crumble. Divide ¾ of the bacon among the lined wells, reserving the rest of the bacon as a garnish.Drain of most of the bacon drippings and place the skillet on medium-low heat. Add the onions and greens and sauté until the onion is tender and greens are wilted. Add the garlic and cook until fragrant. Divide the greens mixture between the muffin cups. Place the eggs and milk in a bowl and whisk to combine. Pour the egg mixture evenly into each muffin cup. Season with freshly ground black pepper.Bake in the preheated oven for 18-22 minutes. Garnish with the remaining bacon and serve. I think a food swap would be fun. And you don't have to open it up to the community, if that makes you anxious. How about a group of like minded friends that get together and bring their swap goodies with them. All you would need to do is pour some cocktails and put out some cheese and crackers. Fun, fun, fun. I love mini quiches for appetizers, but haven't made any for quite awhile. On this recipe, going by your underwhelmed comment, might try maybe garlicky breadcrumbs?